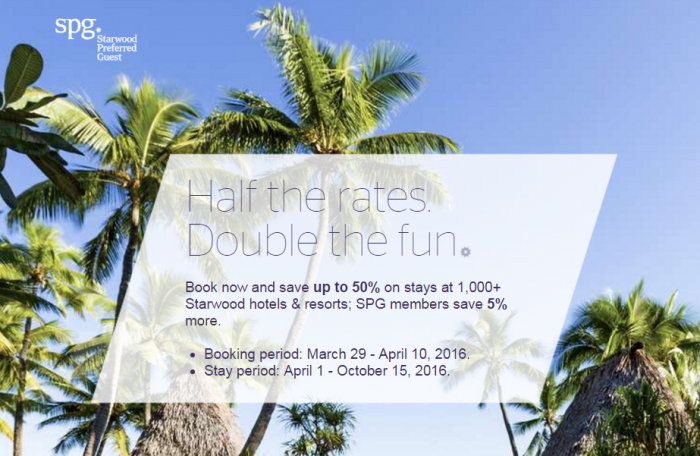 Starwood has launched a separate sale to the one I wrote about yesterday (read more here) that is valid for stays in Asia-Pacific between April 1 – October 15, 2016. You can get up to 50% off plus there is an additional discount of 5% for SPG members. You must book this rate by April 10. You can access this sale on Starwood’s website here. Note that the discount is UP TO 50% off. The likely discount is far less most of the time. Starwood tends to have these sales semi frequently (and they are not always good). It does pay to check the rates under this offer, however. • Offer is valid at participating Starwood Hotels & Resorts. • Offer is valid for stays booked between MARCH 29, 2016 and APRIL 10, 2016 and completed between APRIL 1, 2016 and OCTOBER 15, 2016. • Book online, call your travel professional, or call (877) 782-0108 from the USA (or visit www.spg.com/contact to find our Customer Care phone number in other countries), and mention DAILYDI or SPGDI (Rate for SPG Members with additional 5% off) or DAILYOP (special opening offer for new hotels in Asia Pacific). • The rate shown is already after the discount. No further discount applies. • The offer is up to 50% off in Asia Pacific hotels & resorts and up to 20% off in America, Europe, Middle East and Africa. • The offer is based on each hotel participation and can be different for each hotel.